Navigating through a slow market? Those greedy letting agents, always inflating house prices and pushing the market up, boo, hiss! Hold up, we’re also just as guilty of deflating markets and often unnecessarily pushing prices down. No bites from renters after a month and the agent will be on the phone trying to talk you into dropping the price. 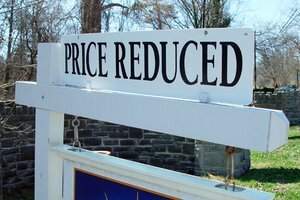 Many agents are even targeted weekly on getting price reductions. But is this just lazy agency or is there a better way? The key question to ask your agent is whether the properties at price levels below are moving. Most of the time they’re not, so why adjust? In our part of Surrey the upper market is tough (anyone who says otherwise is trying to put an understandably positive spin on it but lets be realistic for a minute) we are seeing price reductions from 5%-20% in upper price ranges for the last quarter and many houses still aren’t shifting. With average renewal rent increases each year at 2-3% it takes many years to see your rent get back to the same level after a relatively small difficult patch. Why not spend this money you would have lost on improving the property instead (which is all tax deductible of course!) and making it more lettable. This is an investment property and it needs money put into it as well as taken out in order to stay on top of your game and ahead of the pack. After 25 years in agency (ouch!) I’ve learnt that nothing really changes in the difficult markets; the best properties will always move and that doesn’t mean the cheapest, it means the most appealing which includes price, location, condition, desirability. The last 2 are all too frequently overlooked. Its amazing how paying attention to some small details help get things moving. If the house is empty then pick up the junk mail, there’s little worse than doing a viewing where you have to force the door open because its jammed with pizza leaflets, bad start!. Turn the heating on, open the curtains. These are the easy things and we’re drifting into baking bread territory very quickly but then there’s a bigger picture. Look at your property, if you were buying it now to live in yourself, would you change the kitchen, the curtains, the floor? If the answer is yes then why would you expect a tenant to put up with it? In Surrey we have some stunning £1m+ homes but it’s amazing how many have 20 year old kitchens or cheap laminate flooring. Of course there’s nothing wrong with a 20 year old kitchen but if you’re asking £4000 per month for it and there is a brand new house down the road for the same price but a bit smaller, I guarantee they’ll take the other house. When you go on holiday and rent a car, if you’re given a choice between a brand new VW Golf or a 20 year old Mercedes with half worn tyres and beaded seat covers you’d laugh at the hire company. Take that £4k house as an example, they’ll get a ‘weekly price reduction’ call from their agent to reduce the price to £3500pcm. A month later the calls will be to reduce it to £3k pcm. We’re now 3 months down the line with £12k in void periods lost. If you’re lucky to get a tenant at that point you’re now £1000 a month down on rent going forward, £12k pa less than 2015. £24,000 lost just in a year. Turn this around, spend some or all of that money that you’re going to lose anyway on improving the house so it gets let sooner, without that void and hopefully without that price reduction. This lessens void periods next time, gets you better tenants and stops a whole load of problems! You may not have the money to do the works but speak to your lender and accountant about the situation, its often advantageous to borrow a bit more and definitely worth it in the bigger picture. If you have a good agent on your side then they will give you positive advice on how best to spend your money and what they can do for you beyond just making a phone call asking you to drop your price….again! You could even tell your agent what your bottom line is and they can then transfer people who register at lower levels to look at yours too. Everyone loves to think they’re getting a bargain, easiest sales technique ever. So, instead of a race to the bottom on price, why not try a race to the top on presentation. I’m confident it will have a better effect and keep our market healthier for all.